Stop in this weekend! We've got some new bartenders and have a weekend full of local live music! Keith Jones and the Makeshifts, Anthony Ray and Emilee Clepper Tonight and Deviator and Calamity Days tomorrow! Hope to see some new faces this weekend! 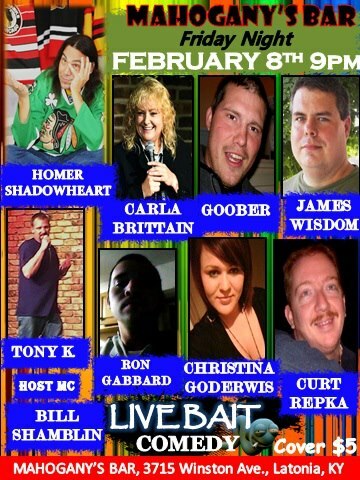 Live Bait Comedy tonight @ Mahogany's Bar in Latonia, KY Stop in for lots of laughs! Mahogany's has a full schedule for February! We have Live Music and Comedy! What more can you ask for? Mahogany's Bar is now booking entertainment for March and April! Also still looking for a Host for our Tuesday Night Open Mic! Contact Bob at 859-991-1542 for more information!